Since 1971, the Department of Biology in Camden has made available a program leading to the degree of Master of Science in Biology. Within the Master of Science in Biology program, opportunity is provided for concentrated study and research in a variety of fields in cellular and molecular biology, ecology, neuroscience and physiology. Although fully capable of meeting the requirements of the full-time student, the schedule of the program, with classes offered in the late afternoon, evening, and on Saturday, has proven to be especially attractive to those students whose outside obligations limit the hours of attendance or the number of courses they can take each term. Students have up to three years if full-time, or five years if part-time, to complete degree requirements. More than 100 students have completed the master´s program in Biology at the Camden campus and have gone on to PhD programs in the biological sciences, to professional schools, to research institutions, and to positions of responsibility in industry, education, and environmental management. Most members of the Graduate faculty are also affiliated with MS-PhD programs in New Brunswick, such as Cell and Developmental Biology, Ecology and Evolution, Neurosciences, and Plant Biology. A number of students receiving the MS degrees in Camden have continued for a PhD with one of the Camden faculty through enrollment in these University-wide programs. The facilities of the Department of Biology in Camden are housed in both the Science and the new Business and Science buildings which provide space for instruction, research, and study. The teaching and research laboratories are equipped with a variety of research-quality instrumentation that allows for basic and advanced procedures in cytological, physiological, molecular, ecological and environmental analyses. 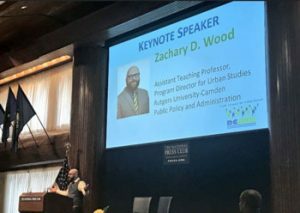 Zach Wood Delivers Keynote Address at Summit in D.C. Page last updated by Department of Biology at 10:25 am December 16, 2016 . This page was printed from http://biology.camden.rutgers.edu/graduate-program/ at 7:05 AM Sunday, April 21, 2019.